Price Improvement!- La Vita #1307- Enjoy amazing sunsets and bay views! 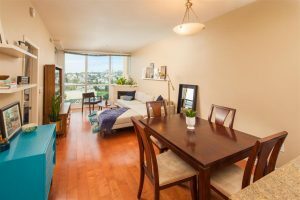 La Vita is located in the highly desirable community of Little Italy in Downtown San Diego. This building is located 2 blocks away from the heart of Little Italy just a short walk to hundreds of restaurants, bars and coffee shops. La Vita consist of two towers, a 24 story high rise and a 8 story mid rise. The community features a pool, jacuzzi, fitness facility, amenity room and a BBQ area in the resort style courtyard. Aside from the fact that this home is located in possibly one of the best locations in Downtown San Diego there’s other aspects that make it appealing. The floor to ceiling windows give this open floor plan a bright look with plenty of natural light throughout the day. The balcony is big enough to be able to enjoy some time outside and take advantage of the great weather. This home features an extra large in-unit storage closet by the kitchen that can easily accommodate things such as surfboards, kayaks or a shelving mechanism for extra closet or pantry space. The laundry closet is also bigger than other one bedroom floorpans at other buildings giving you extra room on the sides to place cleaning and laundry supplies. This residence at La Vita will provide you everything you need to enjoy a great urban lifestyle with resort type living in one of the trendiest communities right now. With the new improved price of $519,900 I don’t see this home being on the market for too long. 1 bedroom residences in Little Italy have increased 8.2% in the last 12 months. Latest comparable sale in La Vita is Residence 1507 sold for $506,000 six months ago placing residence 1307 right at market considering appreciation.